I've been waiting for that "special" pumpkin to pop up somewhere this year, and I think I may have just spotted it in the October issue of Chatelaine Magazine. 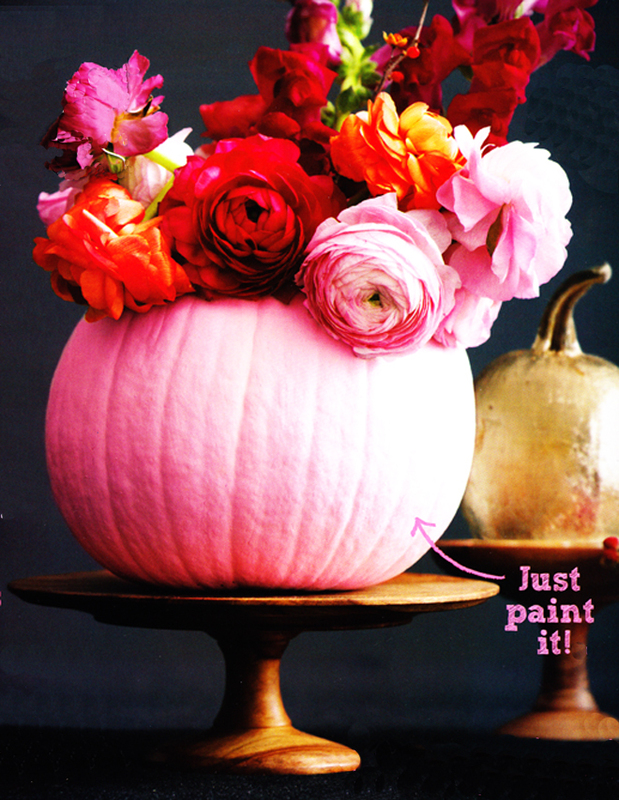 I never thought it would be pink, but this painted pretty pumpkin is definitely a showstopper. Suggesting you put down the knife, because painted pumpkins look twice as nice; Chatelaine made these in contrasting pinks and a few others in gold leaf and plaids. See more (including instructions) on their site here. (Photos by Roberto Caruso). Related: I did a post on a few more pumpkin decorating ideas today at Babble. Click HERE to see. Qué bonito, ahora que se acerca la época de las calabazas, creo que lo intentaré!!! And why not, they're absolutely gorgeous! What an awesome idea! These are so gorgeous! *gasp* My mind is suddenly aspark with endless possibilities. Thanks for sharing! I mentioned this on my blog today! What type of paint would work.best for this project? Cute, indeed! So I guess I have to find some antique pedestals? I will be doing these DIYs this fall! Thanks!